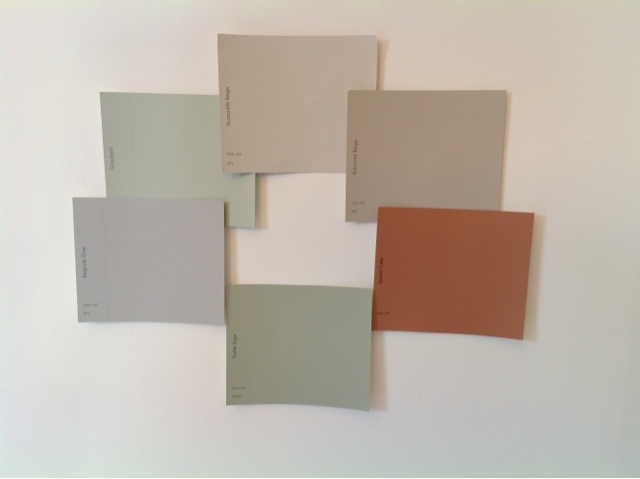 I had a color consultation with a designer from Sherwin Williams yesterday to pick colors for the house. I don't know if they offer this service everywhere, but by buying a $75 gift card, I got to spend an hour and a half with the designer. She started with a walk through of the house while I described how we used each room, what furniture was staying, etc. and then we got to the fun part. We started with the main color that would be used for the foyer and all hallways. Then, we moved to the family room and kitchen. Because they are open to each other and share a wall, we needed a color that would work for both areas. After that, we moved to the morning room. We built on each previous color, ensuring that the rooms would flow well. The dining room, office and powder room were next on the agenda. From the top clockwise: Accessible Beige for the foyer, hallways and stairwell; Balanced Beige for the family room and kitchen; Spiced Cider for the morning room; Svelte Sage for the dining room; Requisite Gray for the powder room; and Grassland for the study, which is my craft room/office. 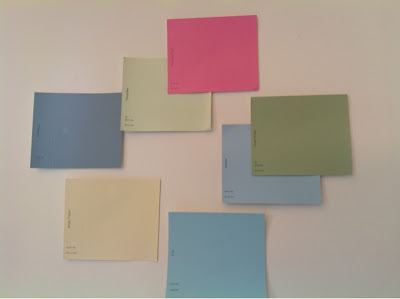 For the upstairs, we chose Honeydew and Vivacious Pink for DD's room; Great Green and Stream for YDS's room; Cay for the kids' bath; Jersey Cream for the laundry room; and Poolhouse for ODS's room. We did not pick a color for the master bed and bath as I am planning to get new bedding and haven't settled on a color scheme as of yet. Again, I'm not sure if it's everywhere, but our Sherwin Williams is having a 40% off sale April 19-21. The color consultant said that that is what her employee discount is and that it doesn't get any better than that. I am really looking forward to getting some color on the walls! Very pretty colors! I love the dining room color I have looked at that one myself. The kids rooms are going to be great! Cant wait to see it up on walls. Yes it is available in our area...and a good discount. I had picked colors and a designer at Basset helped me select...gives real harmony to the downstairs. We haven't decided on upstairs yet. So much fun to decorate!! !